Datsuns built in Taiwan under their own brands, YLN and Yue Loong, rather than as Datsuns. I think today they do brand them as Nissan cars. 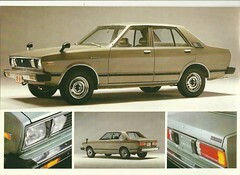 This is the same car we had in North America as the 510 in 1980.